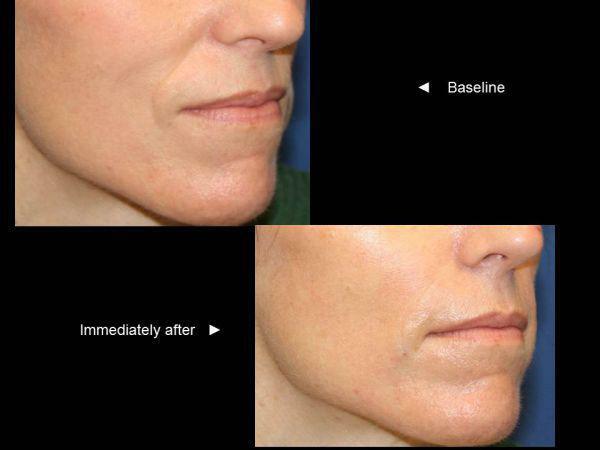 We typically use Juvederm Ultra Plus for the nasolabial folds, however, there are times when a very minimal amount is needed. 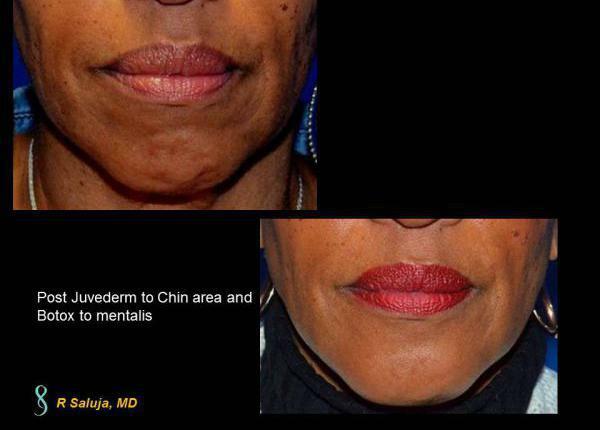 In these cases, we will utilize Juvederm Ultra. 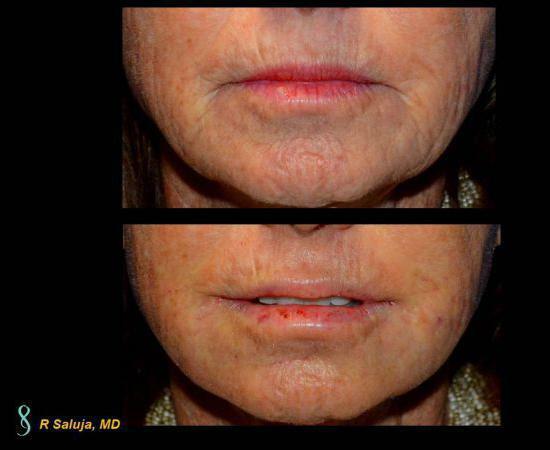 This Huntersville, NC patient had Juvederm Ultra to the nasolabial folds and this is immediately post injection. Filler to the Nasolabial folds in this Huntersville, NC female. This is immediately post injection. Just like a marionette puppet, when we begin to lose volume, we begin to show lines at the side of the mouth termed the marionette lines. They give us a sad look with the line going downward from the edge of each side of the mouth. At Saluja Cosmetic and Laser Center, we treat this area with a little botox to minimze the downward pull and also with some Juvederm Ultra to fill in this zone. This Charlotte, North Carolina lady was bothered by her lines and a litte filler improved the appearance. 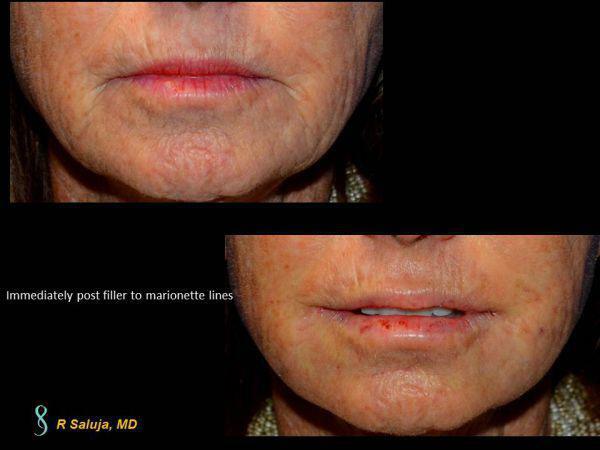 Injection of 1 syringe of Juvederm Ultra Plus to the nasolabial folds and Juvederm Ultra to the marionette lines. This is immediately post injection. While filling is seen, greater filling occurs over the next 2 weeks as the molecules of hyaluronic acid pull in more fluid. 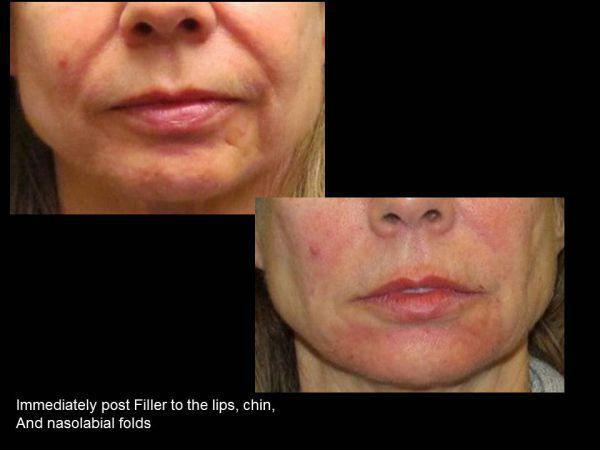 Fillers to the chin and lower lip area help to balance the lower aspect of the face. 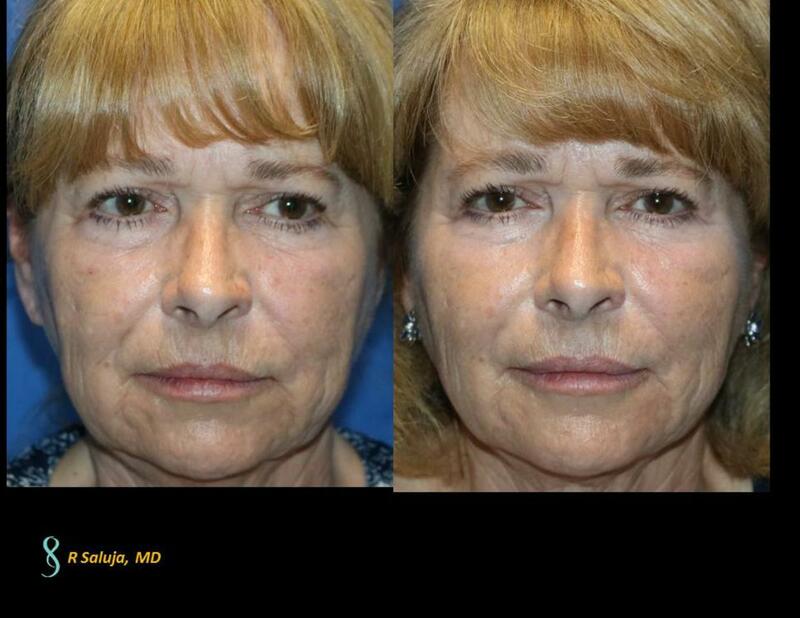 We lose volume (fat) from our face over time and often times, a little filler to the lower aspect of the face helps to re-establish proportions. 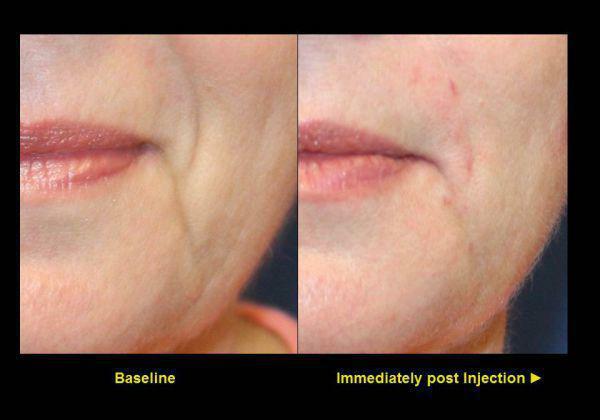 Often times patient might ask whether they need filler or laser and the reality is, both are needed (along with Botox!). Fillers help restore lost volume so that there are no divets or wrinkles created because of loss of structure. Skin tightening lasers such as Fractional CO2, Erbium, Picosure Focus Lens, or Fractional Nonablative all work by stimulating collagen to improve the texture of the skin, tone, pore size and wrinkles that are grooves within the dermis. When combined together, the results can be significant. Each syringe of Juvederm Ultra Plus is 1ml or 20% of a teaspoon, which is not a lot. However, Juvederm is made from hyaluronic acid which is a humectant so it pulls more fluid in. 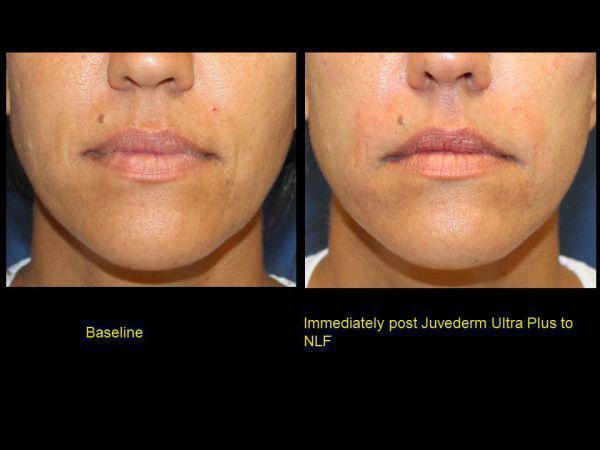 This is a patient who is status post Juvederm Ultra Plus to the nasolabial fold. Immediately post injection there is some minor swelling that can be noted which typically dissipates over the next 1-5 days. Patients often inquire what they will look like immediately post filler. Bruising can occur, so it is important to not schedule this right before an important event. There will be minimal swelling which resolves over 3-5 days, but the area may be a bit tender to touch for 1-2 weeks. A little filler can make a world of difference in placing back what has been lost as seen with this Charlotte, NC female. With time, we begin to lose volume, especially in the lower face. The marionette lines become pronounced and we begin to see the actions of the underlying mentalis, which leads to a "golf ball" appearance. Re-establishing the volume with Juvederm and adding back Botox to the mentalis, helps to smoothen the chin. 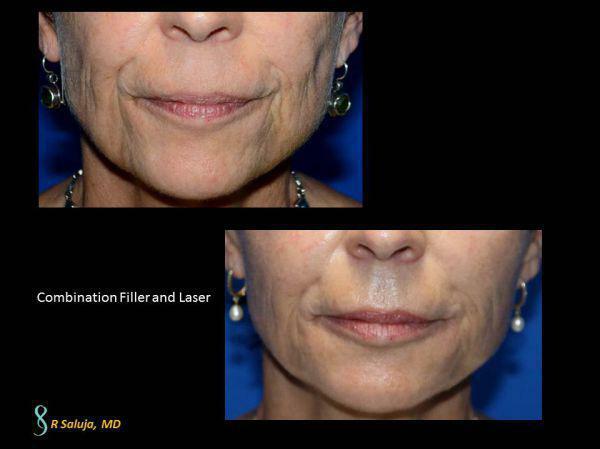 This Huntersville, North Carolina patient is status post filler and botox to the chin area. 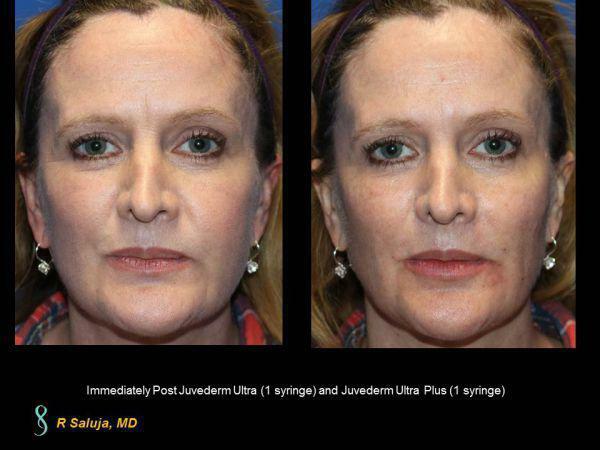 Juvederm Ultra is one of my favorite injections to helps soften the marionette lines and help to fill in the wrinkles that area created with time around the lips. 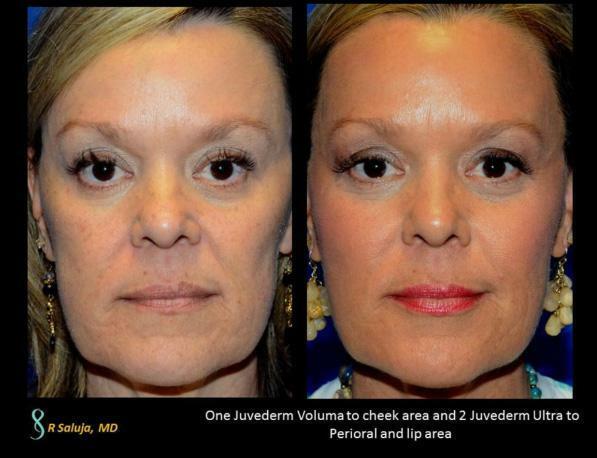 Juvederm Voluma helps to restore the volume in the midface and can last up to 2 years. 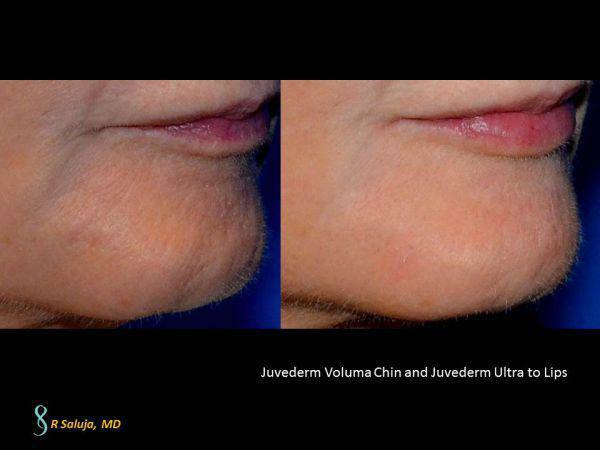 Juvederm Ultra is utilized for more superficial filling. This photo is of a lady in the Charlotte, North Carolina area who wanted to restore the lost volume to her face in a natural way. 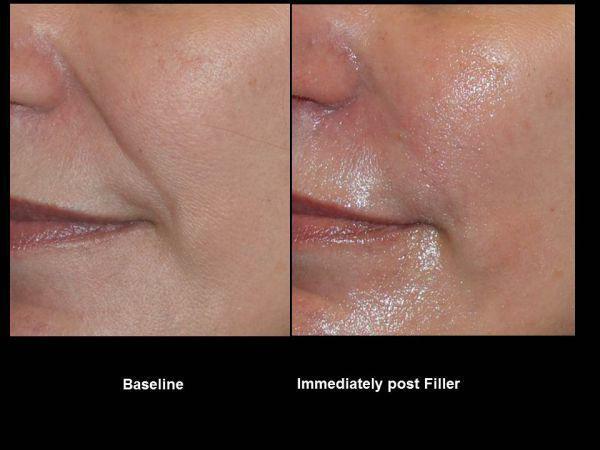 Filler is meant to look natural and soften the areas where volume is lost. Instead of "the liquid facelift", I think the most appropriate name is "the filler refresher". 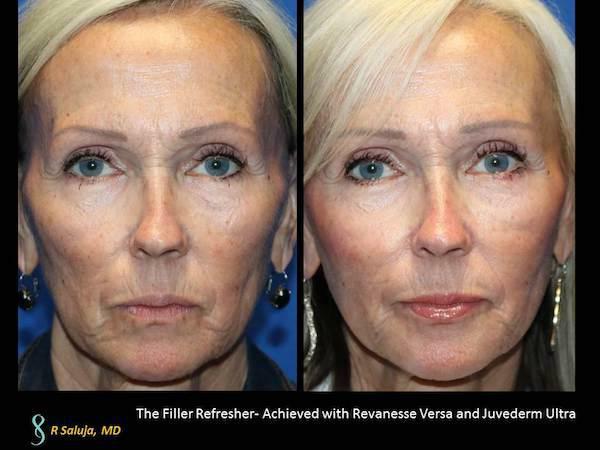 This patient is status post filler with Revanesse Versa and Juvederm Ultra, to achieve a refreshed look. 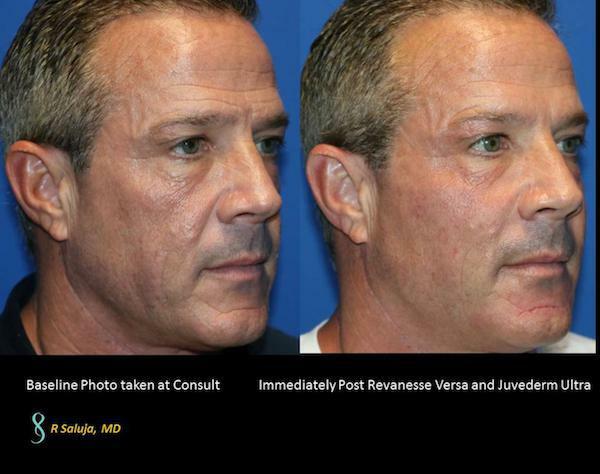 We used Revanesse Versa and Juvederm Ultra on this patient.